The New Metrics of Website Success. HubSpot’s Website Grader tool allows businesses to get a breakdown of where their site is strong and where it needs improvement across those four areas. HubSpot Research has analyzed the results of over 1 million submissions to benchmark how websites are doing today. Are Websites Making the Grade? Not really. The average grade for websites is 60.9 out of 100. That’s a D-. Where are websites falling down? 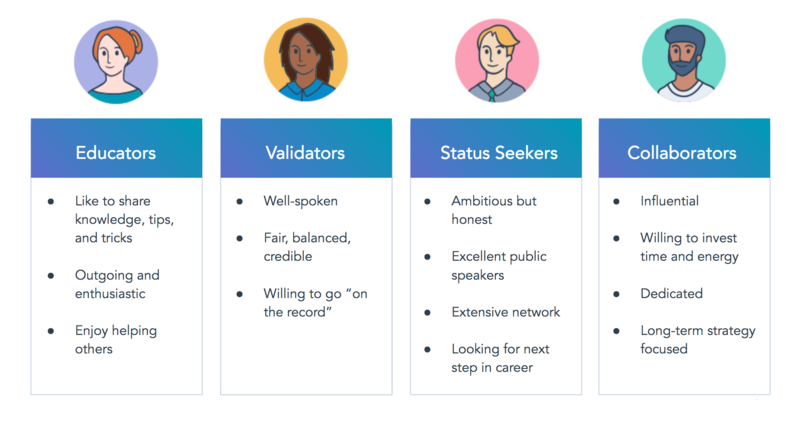 Across the board, HubSpot Research sees gaps in all four attributes. Take 3.7 seconds to load. Have a page size of 1.2 MB. Overall, websites are scoring just 18 points out of 30 in performance. For HubSpot, performance means how quickly a website loads content for each visitor. Many websites have factors which slow them down. We’ll cover each element of the score in detail. 81% of websites have render blocking - a solid number but it can be improved. Not sure what render blocking is? Picture driving on a one lane road. If there’s construction, or something that’s blocking traffic in your lane, the obstruction has to be cleared before you can move on. This is similar to how a browser loads a webpage. If the browser encounters an external script (such as a Twitter module or a third party service the website is using), that script must first make a request, load, and finish before the browser can continue to load other assets on the page. Defer any non-critical 3rd party scripts to load after all your core website content. This may extend your Time to Load (TTL) metric, but it will make for a faster rendering experience. Remove or make scripts asynchronous so they load in conjunction with the rest of your page. Compression can especially help browsers load image heavy pages faster. When a browser is downloading the contents of a website and encounters an uncompressed image, it must download the entire image and then resize the image based on how the website developer had configured it on the page. This means that an image may be set to display on the page as 500 x 500 pixels, but the source file that must be downloaded first could actually be 5000 x 5000 pixels. The browser must load that massive image first. Without compression, that original source image is potentially 4MB in size. Imagine a user connecting to the website using the cellular connection on their mobile phone -- and being forced to download a 4 MB image just to load the home page. When an image is compressed, that same 4MB image could become 2.4MB and save the browser from loading that additional 1.6MB. Further, if your website is image heavy, consider image resizing to speed up performance. Using the same example above, if the browser only needs to load the 500x500 image, it would save even more space and load more quickly. 1% of websites have redirects. Since so few sites have redirects, this performance component isn’t a problem today. Redirects can cause load time problems when a browser begins to download content from “page 1” then encounters the redirect and has to load content from “page 2”. 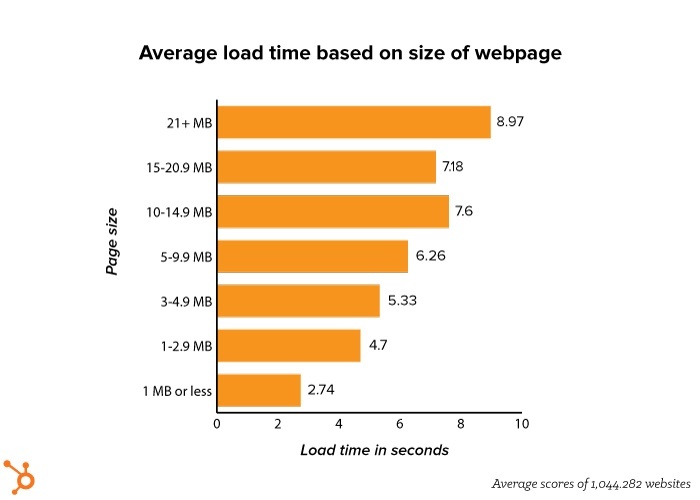 Speed to load is the key performance component for websites today. The websites in our dataset take 3.7 seconds to load on average. All websites should aim to load in 3 seconds or less. Speed is important because studies indicate that 40% web users expect a load time of 3 seconds or less. Otherwise they’ll abandon a site completely. Consumers who stick around end up developing a negative brand perception for businesses with slow websites: “79% of shoppers who are dissatisfied with website performance are less likely to buy from the same site again”. Slow sites affect a business’ bottom line. It’s definitely possible to increase speeds -- for websites in the top quartile of our dataset, the load time is 1.11 seconds or less. The figure below breaks down the ‘heaviness’ of a site and their corresponding load times. 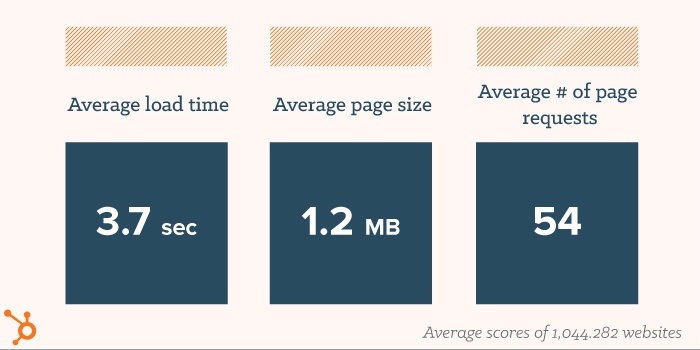 On the whole, the data is intuitive: larger sites take more time to load. However, administrators of websites that are 15-20 MB in size have found ways to optimize their site to buck the trend and load faster. Besides following the best practices listed about, websites of that size likely have invested in a CDN, or has done some FEO (Front-End Optimization) to speed up load times. However, once websites get beyond 20MB, the average load time becomes untenable. For those old enough to remember, 8 second load times recall the old dial up days when one had to sign on to the internet before they could start browsing. Compress and resize images as much as possible. Reduce, or remove, any non-asynchronous requests. Everything should load as quickly as possible, and anything that is blocking this from happening should be removed or deferred. 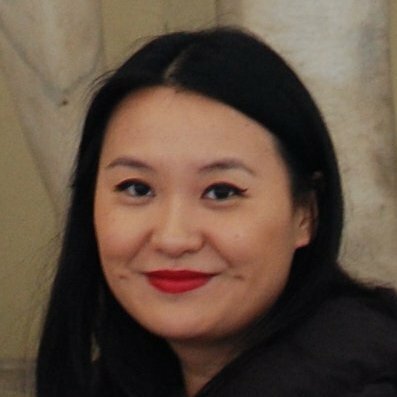 CSS spiriting can be extremely effective method for loading images, if you have a developer or someone familiar with the technique. If you have long pages, defer loading some of the content until the user begins scrolling. Think strategically about the order assets are loading in. Your main CTA should not be last on your page because the user will have likely moved beyond that CTA by the time it displays. The mobile readiness score declined from a C to a D year over year, with websites getting an average of 20 out of 30 points. Mobile readiness relates to how well a website loads and performs on a range of mobile devices. The two key attributes HubSpot focus on is whether the site is mobile responsive and if it has view ports that allow website administrators control the width and scale of their pages as they appear on different devices. 69% of the websites we analyzed have view ports and 65% are mobile responsive. These numbers are still higher than enterprise norms: a recent study in April 2015 found that only 44% of Fortune 500 websites are mobile ready, which makes sense given that enterprises tend to have websites that span hundreds if not thousands of pages, host websites on internal legacy systems, and have a slow pace of technical change. When it comes to mobile readiness, SMBs are able to punch above their weight and favorably rank against the big guys. This is because Google looks for mobile responsivenessor a dedicated mobile site in their search algorithms. All businesses should focus on ensuring their websites are mobile ready. On the whole, Google recommends the responsive design methodology above setting up a separate mobile site, perhaps selfishly, since it’s easier for their web crawlers review a single responsive site rather than two separate sites (mobile and desktop). Responsive design is better for the a website’s SEO too, as the risk of cannibalization via a separate mobile site is eliminated. Google (and other search engines as well) also treat mobile ranking slightly differently than desktop. A company could have the #3 position for a keyword on a desktop, but if they’re website is not optimized for mobile, they may not even be on the first page. Run your website through Google’s mobile friendly test to find out where your website stands. Strategize the right optimization option for you: responsive design or a separate mobile site. HubSpot recommend responsive design since it’s favored by search engines, but either will work. Plan your next website redesign around mobile behavior. Search engine optimization (SEO) is a comparatively mature practice in internet marketing, yet the average score for SEO is 18.1 out of 30. It is surprising to see such low scores but luckily this attribute is the easiest for marketers and website administrators to address directly. The scores also reinforces that notion that a consistent and thorough approach to SEO is key. As new web pages are added, SEO may become spotty across a website. Websites today often have various authors across different pages. Not all website contributors are trained in SEO basics to ensure pages follow a strategy of interlinking or are designed to prevent cannibalization from a pre-existing page. As website content explodes, a meta description or heading tag may be overlooked, and many pages that are added are not optimized. Over time, these gaps across individual pages build on each other to negatively affect a site’s overall SEO. Marketers should focus on auditing their pages, finding the gaps, and fixing them. A regular audit should be scheduled to ensure SEO optimization doesn’t fall through the cracks as websites grow. 75% of websites have page titles. This number should be 100%.No excuses! Page titles are a basic element of page design and appear in search results. The 70 characters that comprise a page title directly impact search ranking and click through rates (CTRs). 59% have heading tags. Headings, or H1 tags, reinforce the keywords found in the page title, and orients the visitor to the contents of the web page. A visitor will want to see heading tags that relate to the topic they were looking for. 55% have site maps. There is some debate on how important sitemaps really are to SEO. According to Google, “in most cases, your site will benefit from having a sitemap, and you’ll never be penalized for having one.” Especially for larger website (those with more than 60 pages, which is the majority of our sample), including a sitemap is a best practice that allows your web visitors to easily navigate your site. Just 42% have properly configured meta descriptions. A meta description is the few lines of text (155 characters or less) that appears under your page title in a search result. It effectively describes the content of the webpage to a potential website visitor. It should clearly outline what’s in the page and why someone should click into the link. Without it, a searcher has no real insight on what’s in your page. Likewise, if you have more than 155 characters, the description gets cut off. Meta descriptions are just as vital to click through rates (CTRs) as the page titles, and should not be overlooked. Perform an audit of your website. Seek out and address missing page titles, heading tags, and meta descriptions. If your website has many pages but lacks a site map, consider creating one. It will give visitors to your site an easier way to navigate and can only positively impact your website’s SEO. Review the pages in your website to ensure that pages aren’t cannibalizing SEO ‘points’ from each other. For example, an electronics business may have multiple pages optimized for ‘best kitchen appliance.’ Those pages compete with each other for search traffic. Consider consolidating duplicate pages or creating a crosslinking strategy. Businesses are failing their customers when it comes to security. Less than half the sites we’ve analyzed is protected by SSL. We are seeing progress however, as that number increased from just 26% to 48% in the past year. SSL (Secure Sockets Layer) creates a secure tunnel between a visitor’s browser and a website’s web server. The information that is sent over the tunnel is protected, so that a third party can’t peer into the data. It protects the exchange data between the two endpoints, such as a visitor’s username, login password, email address or the personalized cookies that the website sends to the visitor. Since Google’s recent announcement that SSLSSL will be a ranking factor in search results, all business must start prioritizing the security of their sites. In fact, one of Google’s Webmaster Trends Analysts said that HTTPS can be a ranking tie-breaker between two otherwise equal sites. So SSL doesn’t just keep your visitor’s connection to your website secure, it also has a strong SEO implications. More importantly, businesses need to safeguard their customers’ information. In the past years, historic breaches affecting Fortune 500 companies, as well as national governments, have been in the news. For every Target or Sony Pictures of the world, there are also thousands of small businesses that, after being breached or affected, often suffer even more disastrous financial consequences. Most don’t have the funds to cope with the after effects of a breach and end up closing shop. Ensure that your content management system has SSL capabilities enabled. If they don’t, your options are unfortunately limited. Press your host’s customer support and development teams to prioritize SSL and request a timeline. After seeing the increase in weight given to SSL sites and hearing feedback from our customers, HubSpot recently enabled one-click SSL within its website platform for free. If you cannot obtain a solid timeline for SSL protection from your website host, consider moving your site to a one that has SSL as a core feature. The majority of websites HubSpot analyzed would have received high marks five years ago, but websites today are clearly behind the curve. Website design, and its corresponding user experience, operates on a sliding scale that evolves over time. Mobile responsiveness, security, and many aspects of SEO and performance we covered in this report weren’t as big of a factor in the past. But technology has changed so much, what didn’t matter yesterday makes all the difference today. What does this mean for marketers now? Websites should undergo iterative improvements over time, rather than a carte blanche redesign every couple of years. The model of setting and forgetting your website simply isn’t practical given the pace of technical change and the fierce competition websites encounter to rank highly in search. Ongoing improvements to your website will keep your organization ahead of the curve and help your website make the grade. The dataset consists of URLs submitted to websitegrader.com. HubSpot Research believes the data is compelling because active submissions indicate that the websites in the dataset are truly up and running, are maintained, and have at least one person actively working to improve it. Given that the total internet is massive and there are millions of dead websites, this dataset is a reflection of today’s active website landscape. Over time we will append data and update this report.